The San Leandro Police Department wants to acquire a “Ballistic Engineered Armored Response Counter Attack Truck” like the one above – pretending that it’s some sort of glorified ambulance. The City Council is set to let them do it. In reality, BearCat vehicles are used for regular law-enforcement purposes, such as serving warrants for minor crimes and collecting fines, and as intimidation tools against peaceful protesters. They are part of a broader project to militarize the police and use it as a potent repression tool against all sorts of political dissent. This particular model is outfitted with medical equipment inside, so they can sell it as a “Medevac tactical armored vehicle” – despite the fact that it’ll be used by the SLPD and not by medical personnel. 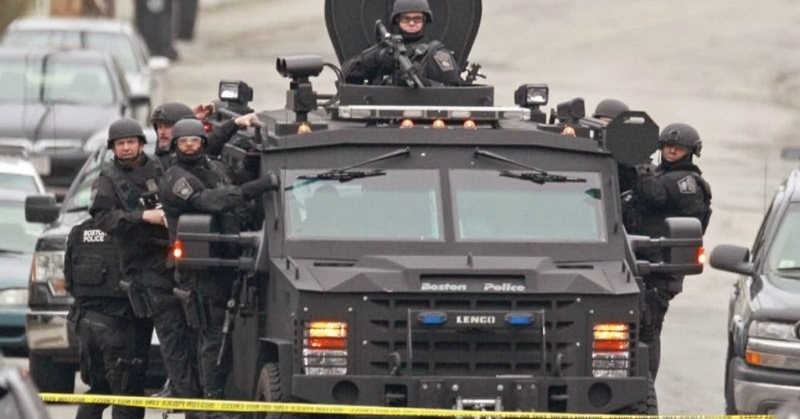 California cities like Davis have said NO to the militarization of police and are giving their tanks back – let’s stop San Leandro from becoming a police state! The show-n-tell on the BearCat vehicle and the Rally will take place on January 8th at 5 PM at the Senior Center (13909 E. 14th Street, SL). There will be an opportunity to ask questions while looking at the vehicle. You can expect your interactions with police, to follow this model. At 6 PM there will be a City Council meeting with a sales pitch by the SLPD, followed by a comment period by the general public. As it’s a City Council meeting rather than a community meeting, there will not be an opportunity for questions to be answered.